Clovelly Park, in Adelaide’s Southern suburbs is a popular and lovely area for families to set up home. Skip bins Clovelly Park are often in high demand due to the amount of people moving in or improving their properties. There’s often call for skip bins Clovelly Park when people need to clear gardens, renovate their home or just have a good tidy-up! Best Price Skip bins are well-placed to help you with ordering Clovelly Park skips. We’re a well-established, family-run company which places emphasis on excellent service and affordable prices. The cost of Clovelly Park skips don’t get better than they do when you order with us. This is because we’re committed to finding our customers the cheapest skip bins possible. We’re able to promise this due to the fact that our many years in the business have allowed us to connect with all of the best suppliers. When you call us for a quote or to order, we immediately set to work to find out which supplier in the locale is offering the lowest price. That’s the skip bin you get. The cheapest one…every time. This saves you cash and because we only deal with excellent suppliers, your skip bin can be delivered within 24 hours of you making your order. Get in touch to order yours today! Is there anything I can’t put in a skip bin? Very little! We accept most waste types. We do have some guidelines and we can’t accept asbestos or liquids. If you do have or suspect the presence of asbestos on your property, contact the proper authority and have it removed safely. The waste types we do accept include general waste, green waste, concrete/bricks, soil and even mixed waste. 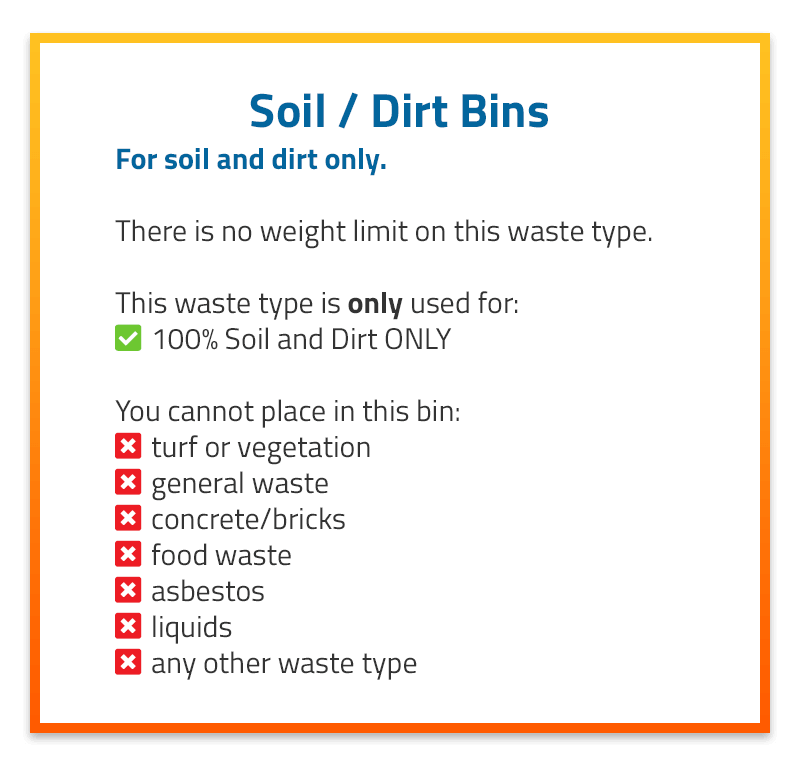 You might wonder why ask that some waste types are separated in our skips– it’s to allow for recycling when possible! We’re an eco-friendly company and the environment is important to us. Did you know that dumps charge extra for certain items that you may need to dispose of including mattresses and tyres? But you can save some money by using a skip bin instead of taking it to the dump. With mattresses, just remove the outer material off the springs and put them separately in the skip bin. The springs can then be disposed of as scrap metal and the material is general waste. 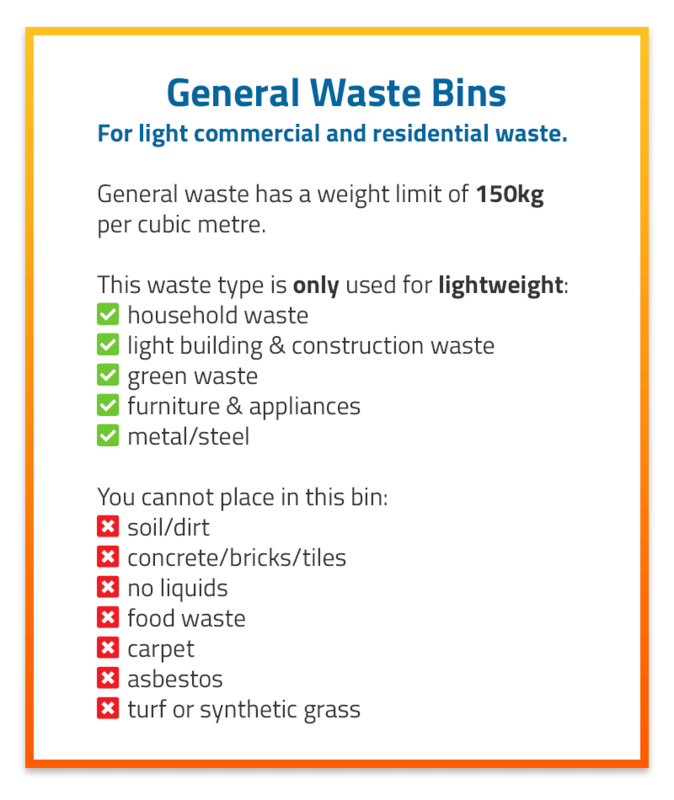 If you are unsure about what can go in your skip bin or if garden waste can be mixed with household rubbish, just give us a call. We’re always happy to help! It can be tricky, working out which size skip bin you need. Check out our useful infograph below…this is a great way of visualising what our various skips look like when compared to an averagely sized man. From there, you can work out how big or small you need your skip to be. Mini skips Clovelly Park are perfect for those people who only have a small amount of waste to handle. If you think you’re going to need a larger skip bin, consider how large your biggest waste item is and go from there. When you pack your skip bin, begin with the flat items such as boards or doors., lay them flat. Take other things, such as old chairs, apart if possible, to enable you to fit things in better and save space. Below are the skip bin sizes we have available. 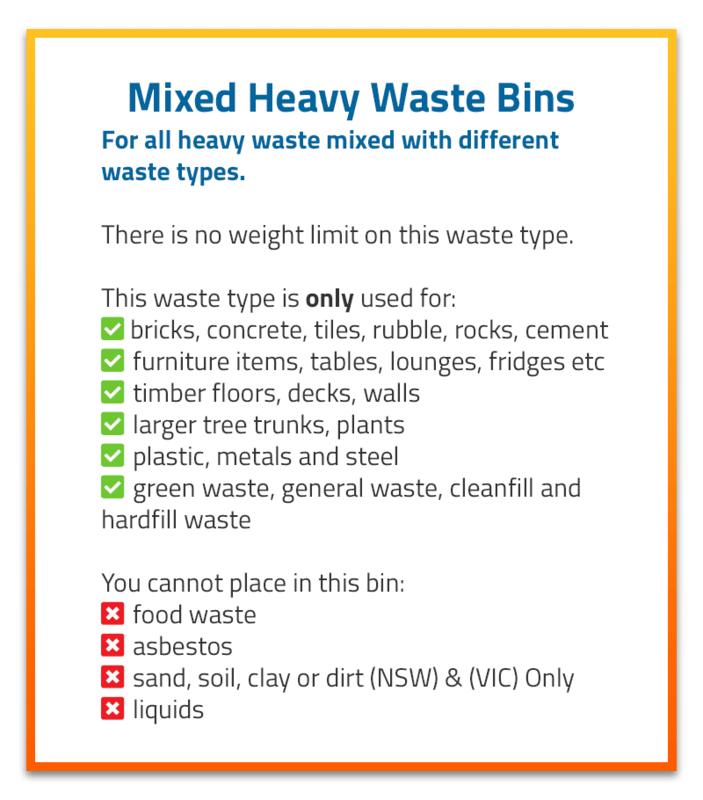 How do I find the cheapest skip bin hire Clovelly Park? Call Best Price Skip Bins of course! As mentioned above, our dedication to finding our customers the cheapest possible options, is what drives us. Using our extensive industry links, we find you a great deal so that you don’t need to worry about calling multiple companies! We only work with the best skip bin hire Clovelly Park companies and have access to them all. Once you enter your postcode into our easy-to-use order form, add your waste type and skip bin size, we will find you the cheapest skip available. We aim to provide you with the highest quality service for all your rubbish removal requirements. Are skips Clovelly Park the best way of removing my rubbish? Definitely! You basically have two options when it comes to rubbish removal. The double handling method or the easy way. It’s hard enough work filling a trailer, but then to have to take it all the way to the nearest dump then unload it all again is too much bother! Not to mention the dumping fees, needing to reverse a trailer or even having to hire a trailer in the first place. Skip hire is convenient, clean and fast. Thanks to our unique system, it’s also affordable! Skips Clovelly Park are without a doubt the best way to organise your rubbish. Do I need a council permit for skip hire Clovelly Park? A council permit is not required if placing the skip on private property. However, if the skip bin is to be placed on public property such as the nature strip, street or footpath, a permit is required. Check The City of Marion’s website for more information. Book your skip bin today with Best Price Skip Bins. You can order online or ask for a quote. We’re here to help you with all your questions, so get in touch!